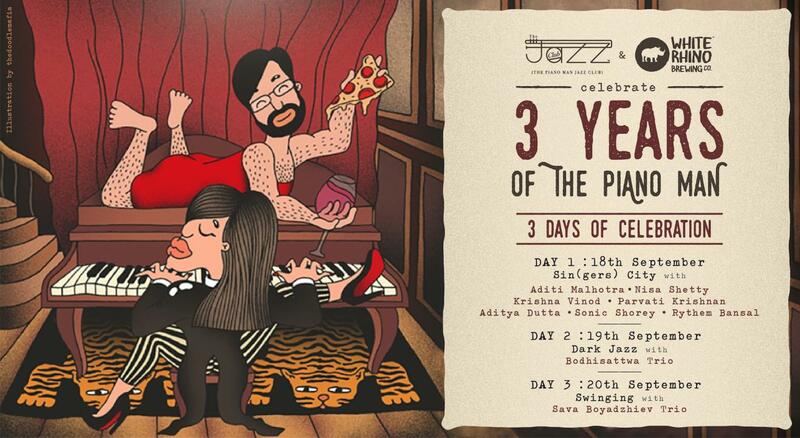 Come be a part of The Piano Man Jazz Club's 3rd Year Anniversary with a power packed 3-day celebration of incredible performances by local and international artists. On the program are shots, popcorn and petit-fours on the hour, every hour! And we have a bonus. For tickets purchase on insider.in, you will receive a 15% off on the Chef’s Menu, another sneak peak at what lies in The Piano Man Jazz Club’s near future. Celebrating jazz in style. Premjit (Kolkata), Rainer (Germany), Shonai (Kolkata) and Sonic (Delhi) are 4 monster musicians coming together to play a night of funk, jazz and blues. Premjit started his musical journey at the early age of 5, when he started learning Tabla. He learnt Tabla for 14 years and is a Sangeet ‘Visharad’ from Bangiyo Sangeet Parishad. He is also a disciple of veteran Conguero Monojit’Kochu’Datta and has learnt the Congas, Bongos, Timbales, Guiro and other Latin percussions for more than 10 years and was an integral part of his bands and projects. Other than Steve Gadd, Elvin Jones, Tony Williams, Changuito, Giovanni Hidalgo, Antonio Sanchez, Miles Davis, Dizzy Gillespie, Herbie Hancock, Herbie Mason, Jeff Campitelli, Wes Montgomery, Jack Dejohnette, Vinnie Colaiuta etc., He draws influence from the nature and tries to imbibe and express that through his music. As an international and renowned saxophonist, arranger and composer, Rainer Pusch has always been interested in trying out new kinds of music. His spectrum ranges from a jazz background obtained during his studies with George Coleman, Jerry Bergonzi, at the Berklee College of Music (Boston) to various performances with jazz, funk, latin and pop bands over the years. He worked beneath many others with Art Farmer, Horace Parlan, John Betsch, Pony Poindexter. Rainer Pusch ́s manifold interests brought him to collaborate repeatedly with many famed Indian musicians such as the Mumbai based guitarists Keith and Karl Peters, with Louis Banks, Dr. Mysore Manjunath, Sanjay Divecha and Ranjit Barot within the scope of Jazz and Indo-Jazz Fusion projects. Further collaborations included recordings with A.R. Rahman and Ramnath Gopalnat as well as many gigs with Ganesh Kumar, Selva Ganesh, Dr. Balamuralikrishnan, and Amit Heri, Manickam Yogeswaran. The ever-evolving Shonai enjoys his musical life as a performer, educator, composer and arranger. Born in a musicians’ family in Kolkata Shonai had got introduced to various genre of music in his childhood time. In his 20 years of performance life he has worked in every possible situations from solo to duet and from bands like trio, quartet and Quintet to Big Bands. Shonai being predominantly a contemporary and jazz Pianist has worked with Jazz stalwarts like Mr.Carlton Kitto, Mr.Andrew Gracias, Mr.Lewis Hilt, Mr.Marcus Dengate, Mr. Clive Huse to name a few. is a professional bassist in the city of Delhi. He is student of Grammy-nominated Greek-American musician Panagiotis Andreou. He has comprehensive stage experience, and has collaborated with musicians from several different genres including classical, fusion, funk and metal. His playing combines complexity with cohesion, and playing melodies with dexterity, musicality and tenacity. Over the last few years, Sonic has collaborated with several bands in Delhi and across India, such as Kaash, Antariksh, Trizya, and Adil and Vasundhara.